To Americans, Toyota offers "peace of mind." 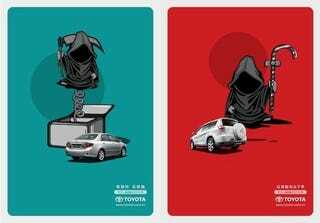 In China, Toyota offers a similar theme, except with cartoon versions of the Grim Reaper looming over its vehicles. It's OK, because sudden acceleration only happened in America. The ad text hypes Toyota's safety features known as the Global Opportunity Assessment: "As a result, the most that the god of death can bring is only a shock like 'Jack in the box', but not any actual danger or harm."